Welcome to winter time here in Curtis, MI brought to you by the MLATB, Manistique Lakes Area Tourism Bureau. We invite you experience our Pure Curtis winters throughout our Manistique Lakes Complex. 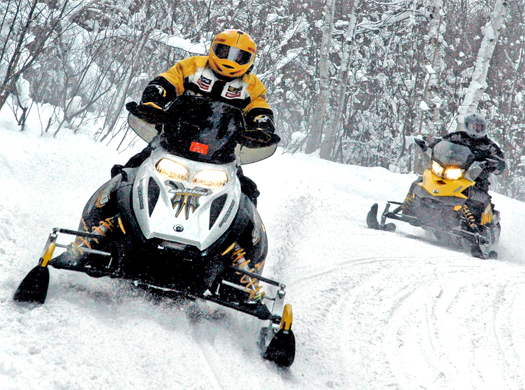 The Curtis Area Chamber of Commerce grooms and maintains 140 miles of snowmobile trails. This incredible snowmobile trail system branches out in every direction and connects with the myriad of trails that total 2,500 miles in the State of Michigan. Curtis is one of the best snowmobile hubs in the Mid-West. Because of our central location, we put you right in the middle of our area lodging, restaurants, lounges, entertainment, and attractions. Bring your family and friends and experience the thrill of the our trails. Find out why so many have said that we offer the best snowmobiling adventure in the U.S. 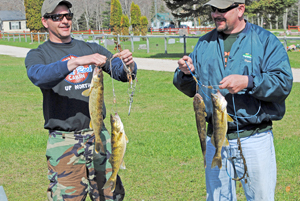 The Manistique Lakes offer some of the best ice-fishing in Michigan's Upper Peninsula. Early in December the ice begins to form. Mick's Bait Shop offers information on ice conditions (link below). 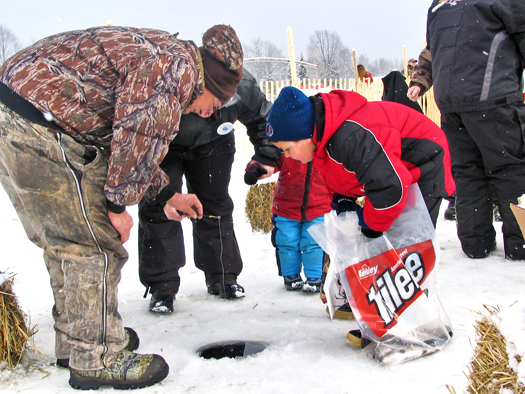 When the ice is safe for fishing, the Manistique Lakes provide a great source for ice-fishing. Many of our local businesses and lodging members offer supplies, shanties and opportunities to ice-fish. Don't miss this unique cold weather activity that is family friendly, exciting and memorable. We invite you to visit their websites and find the amenities that suit your needs. Visit the links below to view our area's businesses. The MLATB has a variety of quality Curtis, MI lodging types to fit your needs. Whether you are looking for lakefront, riverfront, pet-friendly, or perhaps the perfect hunting and fishing cabin, our members have the place for you. Our members offer a diverse selection of accommodations and amenities for vacationers. 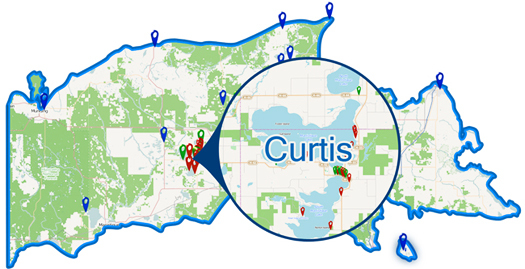 We invite you to check out our Interactive Map and let us help you make your Curtis, MI dream vacation a reality. Since our area has so much to offer, we created this interactive map so that you our guests easily find the business types needed to make your vacation a success. Here you can check out our area lodging, attractions and businesses with the help of our Eastern Upper Peninsula Interactive Map. "Discover Upper Peninsula's Largest Lake Complex." Curtis Michigan is surrounded by the largest lake complex in Michigan's Upper Peninsula. Vacationers enjoy a variety of year-round recreational opportunities and events. We are also within an hour of a multitude of Eastern Upper Peninsula attractions: Tahquamenon Falls, Whitefish Point & Great Lakes Shipwreck Museum, Tahquamenon Falls Wilderness Excursion (Toonerville Trolley), Seney Wildlife Refuge, Oswald's Bear Ranch, Crisp Point Lighthouse, Big Springs Palms Book State Park, and Garlyn Zoo just to name a few. It's never too early to plan ahead for our next warm weather season. Vacationers enjoy a variety of warm weather recreational opportunities, events, spectacular accommodations, water-filled activities, and the Erickson Center which hosts art, music and physical enrichment activities. Please visit the Events Calendar to find dates on: Art on the Lake Celebration, Independence Day "Largest Little Town Parade", and Music in the Park just to name a few. Summer visitors enjoy world-class fishing, hunting, mushrooming, canoeing, kayaking, boating, sailing, swimming, jet skiing, and ATV & ORVing. Curtis also has three area golf courses: The Newberry Country Club, The Indian Lake Golf & Country Club in Manistique and the Hiawatha Sportsman's club. Curtis area fishing video below by Great Lakes Fisherman's Digest.